In 1991, under the bold leadership of then General Manager Sir Allan Fields, Barbados' most successful beverage company, Banks (Barbados) Breweries Ltd. moved to acquire longstanding soft drink manufacturer, the Barbados Bottling Co. Ltd. (BBC). Banks Holdings Limited(BHL) was formed as the parent company effecting the acquisition. Synergies between the then 46-year-old BBC and 3 decade-old Brewery were powerful. Their feisty traditions of quality and innovation, coupled with strong distribution networks proved a great platform for consolidation. The ensuing decade saw 5 new businesses, ranging from distribution to recycling, under the BHL umbrella. In 1994 BHL turned its attention to distribution, purchasing a distribution facility now known as Banks Distribution Limited from Barbados Shipping and Trading Limited (BS&T). BHL’s distribution arm was introduced, meeting the Brewery's and BBC's needs in the distribution sector. 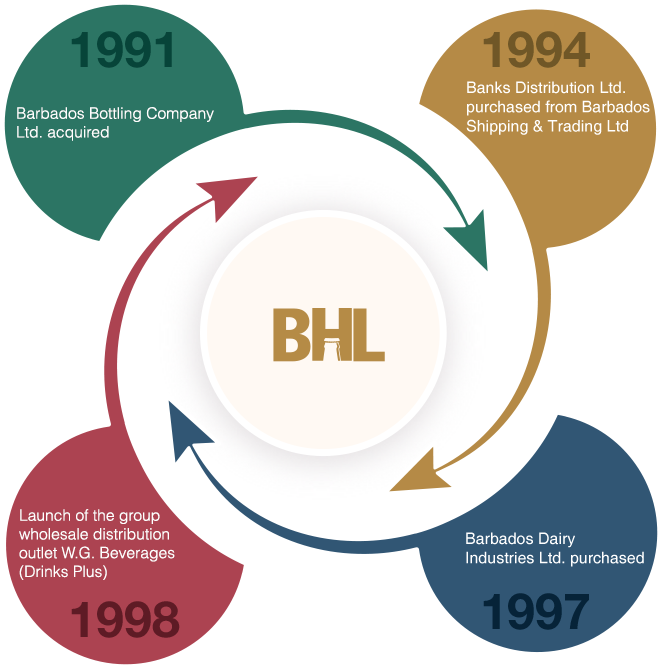 In 1997, Banks Holdings Limited (BHL) purchased the then majority Government-owned Barbados Dairy Industries Ltd. and added to its products, dairy, fruit juices and juice drink offerings. With this move BHL’s position as the largest beverage conglomerate in Barbados was further cemented. In 1998, the wholesale distribution outlet, Drinks Plus was opened complementing the then B&B Distribution. However in pursuing greater efficiencies, 6 years later following a restructuring exercise, Drinks Plus renamed B&B Wholesale was integrated into the B&B Distribution, now Banks Distribution Limited. The year 2002 brought further diversification for BHL as it purchased and renovated the Elegant Hotel Corporate Offices in Warrens, St. Michael, to create The Orange Mall.